Want to plant a cover crop into standing corn or soybeans, apply a herbicide, and sidedress nitrogen all in one pass? 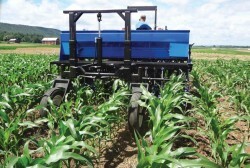 Check out the cover crop InterSeeder developed at Penn State in this PDF. For additional information go to InterSeeder website.